It’s funny to think that early year 2000 when camera phones started to become a hit and everybody who’s got a hip camera phone takes their own selfie almost everywhere. I was well in fact a selfie addict way back then. Tried all types of pose. Hand on chin, hand on forehead, sleeping pose, messy-hair-don’t care look, candid and you name it, I’ve tried it. Fast forward 2018, with all the latest smartphones, you can look glamorous in a just a click and in an instant your phone is filed with all those selfies – pretty, serious, not-so-obvious selfie, OOTD, and of course your phone will definitely have that ONE which is if Instagrammable, wacky, funny picture of yours. And that’s how a picture should be, right? Now also is the era where Photo booths are everywhere! It is now a must-have in any event because we just love seeing ourselves on the screen glowing with happiness. 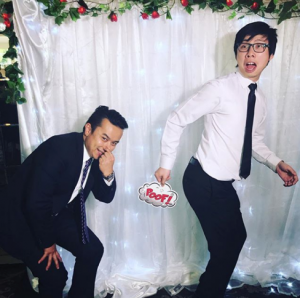 Aside from taking selfies in front of a stunning backdrop, people love acting a little crazy in photo booths and it will be extra fun when you are with friends. But not only that, you get to take home a printed copy of your funniest pose. The bride and groom spent months planning the perfect wedding day. They made sure that everyone will witness the love they have for each other. They made sure that everyone will remember the details of that perfect day…. 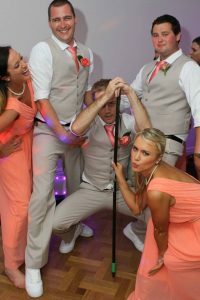 And there you are, creating silly moments captured by our camera guaranteed to make the bride and groom smile. Then it’s a history. We are more than glad to be a part of that memory. Have you heard of Work-Life balance? For some, it is the term used for the idea that an employee need time for both work and other aspects of life, including having FUN. At this company event, this employee sure knows how to work it and have fun in front of our camera. Did we love it? Sure we did. That’s why we at Sharebooth work to have fun. Formal nights can be not so formal after all. People can show their true self and wild side with fun poses and goofiest props. We love seeing guests enjoying the props and making the most out of it. There is no other way to represent what the sign says. So whether we like it or not, the camera world has now taken over us. We love taking memories with those cameras and keeping it forever. And we at Sharebooth love seeing amazing smiles and happy faces. We are not just about helping you take photos, we’re about doing everything we can to ensure those photos look amazing even at your wackiest pose. To learn about our Pricing, turn our Flipbook and choose the package that is just right for you. Still undecided? 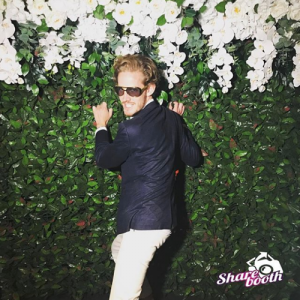 Contact us at info@sharebooth.com.au or call us at 02 9676 7521 and we will work together to make your day extra special.